Digitalisation flying high: Lufthansa and SAP take off for a technology conference at 10,000 metres’ altitude. Topics such as artificial intelligence and the future of work are at the focus. The conference takes place on the flight to Orlando/USA to SAPPHIRE NOW, the world’s largest SAP customer event. This year, “SAPPHIRE NOW” will begin a day earlier: On flight LH464 to Orlando. A FlyingLab is taking place on board, with which Lufthansa is making the opportunities of digitalisation visible and tangible. “This way, we are getting passengers in the mood for the topics of the conference,” says Dr Torsten Wingenter, Senior Director of Digital Innovations at Lufthansa. 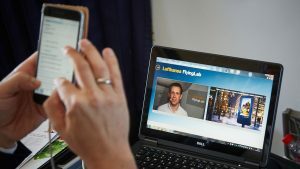 Participants in the Lufthansa flight to Orlando will be welcomed shortly after take-off on 15 May by Dr Jürgen Müller, SAP Chief Innovation Officer via a video clip. “Innovation starts with the exchange of ideas. We are glad to be able to show you on this flight, together with Lufthansa, what the future of digitalisation looks like, and to give the participants interesting food for thought,” says Müller. The FlyingLab always consists of a conference section and a test section. During the test section of the FlyingLab, passengers can try out the latest technological developments. On the ten-hour flight to Florida, this is the “Muse” device – a technology that measures brain waves, provides feedback and supports meditation. Many passengers find flying stressful, and it is particularly interesting for them to try out the “Muse”. At the core of the FlyingLab is the conference section. On board, six speakers give insights into the topics of the future of work (Martin Wezowski, SAP), technical support when travelling (Teemu Arina, author and biohacker) and robots as the future of work (Ingrid Rothe, RSB Partners). The speakers give their talks in front of a camera on the Boeing 747-400. The passengers receive the video livestream and presentation notes via on-board WLAN. This network is independent of FlyNet (internet access) and is installed especially for the FlyingLab. During the talks, the passengers can send written questions to the speakers via their own devices. This not only creates a unique conference atmosphere 10,000 metres above the Atlantic, but also enables a dialogue between passengers and speakers. There have been three on-board Lufthansa FlyingLabs on the topics of the future of travel and virtual reality to San José, to the Fashion Week in New York, and to the digital conference South by Southwest (SXSW) in Austin (Texas). The topics of the FlyingLabs are coordinated with the respective event at the destination. “We thereby offer our passengers a more efficient use of their travel time, and promote dialogue on board,” says Dr Wingenter. With the motto “New Heights with Innovation”, Lufthansa is hosting the FlyingLab together with SAP, and thus with together with a company for the first time. Together with the SAP Innovation Center Network, Lufthansa Digital Innovations will shape the programme for the inflight conference. The hosts, Dr Torsten Wingenter and Upen Barve, who heads the Department of Customer Strategy & Experience at the SAP Innovation Center Network, passengers will be welcomed in Frankfurt with a SAPPHIRE NOW gate event. The largest SAP customer conference will take place from 16 to 18 May in Orlando.